Blessed with a picturesgue village setting, Kaş is a backpackers paradise Kaş offers Action, Advanture and excitement but is also inviting to those wanting plain Relaxation on the Mediterranean coast. Kaş is the perfect place to mingle with the locals and experience turkish hospitality. Relaxed Atmosphere and home comforts. Tea and Apple Tea free. 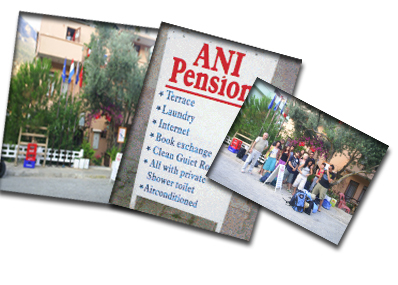 Anı Pension with 15 Rooms, provides suitable accommodation for every type of tourist. Rooms range from simple dormitory style accommodation through to singles and doubles all are fully serviced with clean and modern bathroom facilities.